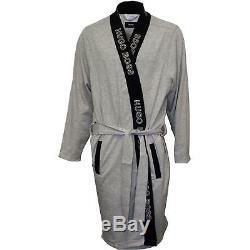 Hugo Boss Identity Kimono Jersey Cotton Men's Bathrobe, Grey/blue. This men's dressing gown from Hugo Boss offers a luxurious quality at a reasonably affordable price. Sporty-looking, calf-length kimono-style dressing gown in a soft, medium-weight jersey cotton in grey, with the contrast blue detailing and logo adding extra style. Can be closed with the wrap style belt, and also features two front slash pockets. Small = 37.4 inch chest (Europe size 46). Medium = 38.6 inch chest (Europe size 48), Large = 40.2 inch chest (Europe size 50), X-Large = 41.7 inch chest (Europe size 52). X-Large = 43.3 inch chest (Europe size 54). All orders will be sent as soon as possible. All orders placed before 2pm will usually be dispatched that day (but may be longer at peak traffic times). If tracking is available on your order the tracking reference will be shown on your order confirmation e-mai. L (see below for more details). Full original packaging and any labels still attached. The amount of duty - if any - depends on the type of goods and their value. We have no control over these charges. With all labels still attached. And should have no signs of wear. Until we receive your item back to Customer Services, the item is still your responsibility. 100% Cotton; Heavy Single Jersey. #1 UK online retailer in men's designer underwear and swimwear. Fully Authorised Stockist for all our brands - 100% authentic, guaranteed. The item "Hugo Boss Identity Kimono Jersey Cotton Men's Bathrobe, Grey/blue" is in sale since Friday, May 4, 2018. This item is in the category "Clothes, Shoes & Accessories\Men's Clothing\Nightwear". The seller is "underu" and is located in Ware. This item can be shipped to United Kingdom, Antigua and barbuda, Austria, Belgium, Bulgaria, Croatia, Cyprus, Czech republic, Denmark, Estonia, Finland, France, Germany, Greece, Hungary, Ireland, Italy, Latvia, Lithuania, Luxembourg, Malta, Netherlands, Poland, Portugal, Romania, Slovakia, Slovenia, Spain, Sweden, Australia, United States, Russian federation, Canada, Brazil, Japan, New Zealand, China, Israel, Hong Kong, Norway, Indonesia, Malaysia, Mexico, Singapore, South Korea, Switzerland, Taiwan, Thailand, Bangladesh, Belize, Bermuda, Bolivia, Barbados, Brunei darussalam, Cayman islands, Dominica, Ecuador, Egypt, Guernsey, Gibraltar, Guadeloupe, Grenada, French guiana, Iceland, Jersey, Jordan, Cambodia, Saint kitts and nevis, Saint lucia, Liechtenstein, Sri lanka, Macao, Monaco, Maldives, Montserrat, Martinique, Nicaragua, Oman, Pakistan, Peru, Paraguay, Reunion, Turks and caicos islands, Aruba, Saudi arabia, South africa, United arab emirates, Ukraine, Chile.